The Circuito de Jerez is one of several F1 capable racing tracks in Spain. It’s not on the official calendar anymore but has hosted both the Spanish Grand Prix, and the European Grand Prix as well. The Spanish race had previously been held at Jarama, but dropped off the calendar between 1982 and 1985. Meanwhile, Pedro Pacheco, the mayor of Jerez de la Frontera, thought they had the ideal place for a new Grand Prix circuit, for both motorcycles and Formula One. The project was intended to provide a place for the Spanish Grand Prix, but also to promote the local area, famous for its sherries. The track was built and ready for the 1986 season, with bikes turning up first, and F1 following in April that year. The first Grand Prix held at Jerez was a stunning race, featuring a tense fight between Ayrton Senna, Alain Prost and Nigel Mansell with Senna coming out on top after scrapping for position almost the entire way. He took victory from Mansell by just one hundredth of a second, with both cars seeming to cross the line at the same time. Despite putting on a good show, the F1 fans didn’t support Jerez as much as they might. One of the issues was the location, with Jerez tucked away in the countryside of Southern Spain. Another concern was for safety, particularly after the circuit saw a couple of serious accidents. In 1990, there was a terrifying accident for Martin Donnelly during qualifying. He was thrown from the car and seriously injured, ending his F1 career. The Spanish Grand Prix moved to Barcelona for the 1992 race, but F1 returned to Jerez in 1994, with the honorific European Grand Prix. A new layout was introduced to improve safety, including better barriers and new chicanes to control the speeds. The 1997 European race was an unusual one, delivering up three identical lap times in qualifying. It’s not unlikely to see two drivers setting the same lap time on occasion, but to have three drivers do it in the same session, and all fighting for pole position, that was almost unheard of. The timing regulators were adamant they had it right, though, so the record has stuck. The polesitter was decided by the driver who set the laptime first. The next problem to befall Jerez was falling out of favour with the governing body, and Bernie Ecclestone, who are both fastidious about the etiquette and procedure on the podium. For that first European GP in 1997, a local mayor stormed the podium to hand out the trophies, whereas other dignitaries were due to do the honours. This caused huge consternation, as you can imagine, and the track was banned from hosting a race. Although the ban was only temporary, Jerez hasn’t actually held another F1 race. It does play a big part in testing, however, and is often one of the locations for pre-season running as the teams build up to a new year. For 2015, it’s the first of three weeks of testing, with the other two completed in Barcelona. As the first test, the track also played host to some of the team launches, as cars are unveiled in the comfort of a pitlane to the waiting media. Even though it hasn’t been on the calendar for more than a decade, Jerez still has its part to play in any F1 season. 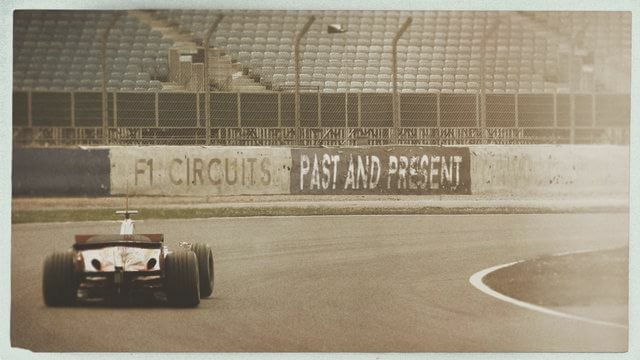 Thank you for listening to this episode of F1 Circuits Past and Present. Do let me know your thoughts on the series so far, and the highs and lows of racing on Spanish soil, email me christine@sidepodcast.com or tweet @sidepodcast. You can find more information about that unusual European Grand Prix in 1997 on the Races to Remember mini series, also available on Sidepodcast. Join me tomorrow for more track trivia!